A hero from the glory days of discovery half a century ago, before the sophistry about man-made global warming invaded climate science, will be speaking at the Fourth International Conference on Climate Change in Chicago, 16-18 May 2010. Kukla at work in Czechoslovakia, from The Weather Machine (book). Photo by courtesy of G. Kukla. 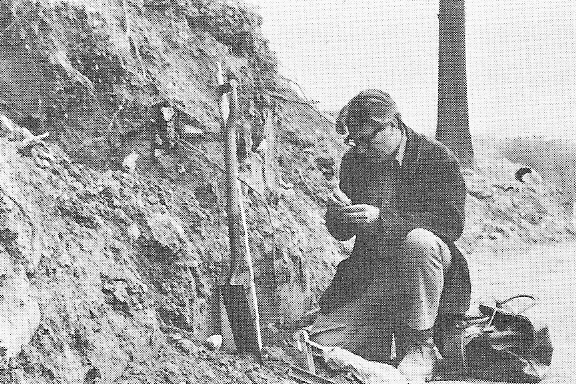 In the 1960s a respected geologist in his native Czechoslovakia, George Kukla, counted the layers of loess – windblown mineral dust ground by the glaciers and laid down in the region during recent ice ages. They were separated by darker material left over from warm interglacial periods. Kukla found too many layers of loess. Until then, almost everyone thought that there were just four recent glacial ages, with long interglacials between them. An exception was Cesare Emiliani, who in Chicago in 1955 had traced major variations in heavy oxygen in seabed fossils, and counted seven ice ages. Very few experts believed him until Kukla reported at least nine loess layers in the brickyards of Czechoslovakia. Following the ill-fated bid for democracy in the “Prague Spring” of 1968 Kukla emerged from behind the Iron Curtain and found refuge at Columbia’s Lamont-Doherty Geological Observatory (now called the Earth Observatory) where he still works. Added 16 May: The wonders of WordPress feedback tell me that only 10% of visitors to this story follow the YouTube link, so I’ll put in the transcript. Narrator: Will a new ice age claim our lands and bury our northern cities? It’s buried Manhattan Island before, when great glaciers half a mile thick filled the valley of New York’s Hudson River. That’s what an ice age is all about. George Kukla is from Czechoslovakia, where he discovered signs that ice ages are far more frequent that most experts have supposed. Today he continues his work near New York City. For him, the next ice age is not at all remote. George Kukla: Well almost all of us have been pretty sure that there were only four ice ages, separated by relatively long warm intervals. But now we know that there were twenty in the last two million years. And the warm periods are much shorter than we believed originally. They are something around 10,000 years long. and I’m sorry to say that the one we are living in now has just passed its 10,000 year birthday. That of course means that the ice age is due now any time. In this post I’ll summarize what was going on in the mid-1970s, about ice age science and climate policy, before catching up with what Kukla thinks nowadays about the coming ice age. Brendan Buckley cores a tree in Vietnam. Photo: K. Krajick, Earth Institute, Columbia U. “Asian Monsoon Failure and Megadrought During the Last Millennium” is the dramatic title of a report in Science that introduces a new Monsoon Asia Drought Atlas. Edward R. Cook and his colleagues at the Tree-Ring Laboratory of Columbia University’s Lamont-Doherty Earth Observatory have used tree-rings from 300 sites in Asian forests to reconstruct the summer “Palmer Drought Severity Index” (PDSI) across India, China and adjacent regions. PDSI is a fairly complicated reckoning of local deviations from mean conditions, originated in 1965 by Wayne C. Palmer, a climatologist in the US Weather Bureau. 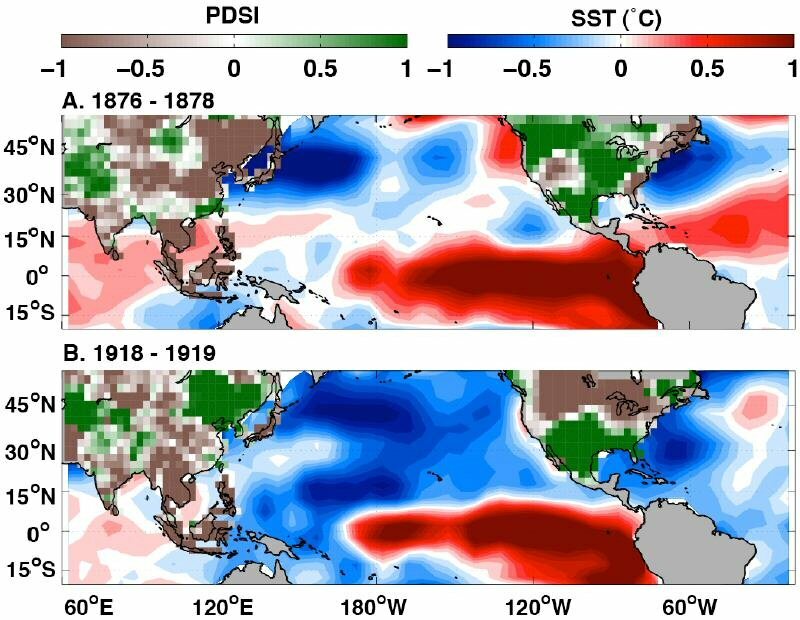 In the following examples, North American data supplement the Asian PDSI, and anomalous sea-surface temperatures (SST) across the Pacific are also reconstructed. On land, brown is abnormally dry, green is wet. On the oceans, red is abnormally warm, blue is cool. Fig. 4 in E.R. Cook et al, Science, 23 April 2010, distributed by NOAA Paleoclimatology. Global warming – want to bet? “The smart money is on global warming,” declared a tipster in the journal Nature, back in 2001. John Whitfield was commenting on a short article in Science about an annual sweepstake on the date and time of springtime melting of river ice at Nenana in central Alaska. As Nature in London and Science in Washington have been the Tweedledum and Tweedledee of climatic alarmism, the prediction was consistent with editorial beliefs. The tripod on 27 April 2010. From Ice Clasic Website. Nenana is about 60 km south-west of Fairbanks, Alaska’s biggest inland city, and the townsfolk manage the sweepstake in support of local charities. They call it the Nenana Ice Classic, and this year’s betting closed on 5 April 2010. Every March, they embed a tripod in the ice covering the Tanana River. When the ice melts in late April or early May, the tripod moves, tripping a wire that stops a clock. Public concern about the size of the jackpot ($279,000 in 2010) ensures consistency and supervision worthy of the most meticulous scientific fieldwork. Supposing you followed Nature’s advice in 2001, and bet on an ever-earlier melt date, would that have helped you to win the sweepstake? If you knew that El Niño warmings and volcanic coolings influence the Alaskan river ice, you might have prudently started from the ten-year average from 1992 to 2001. Correcting for leap years, the average melting date was May 1. In the subsequent nine years, 2002-2010, the Nenana clock stopped as shown here, with leap years starred. Five times the melt was earlier than in 1992-2001, but three times it was later. The average melting date remained stubbornly at May 1. Nature proclaimed in 2001 that “an Alaskan sweepstake has become a record of global warming.” Now the Nenana ice joins the growing number of indications that global warming has at least paused, since the mid-1990s. Engineers who were building a bridge over the river at Nenana started the sweepstake in 1917, and an unbroken sequence of records exists. Regarding the event as a proxy for springtime temperatures in central Alaska, I here plot the data with early melts high and late melts low. The black line is a mathematical curve fitted to the data (5th order polynomial). It has no special statistical warranty but it gives a fair impression of ever-changing trends in the Alaskan climate. Only from 1975 to 1995 was a trend towards earlier ice melts fully consistent with the theory of man-made global warming. By contrast, most of the ups and downs match nicely with long-term decreases or increases in cosmic rays reaching the Earth, as the Sun’s magnetic activity varied. The dip since 2000 coincides with increasing cosmic radiation during a time of weakened solar activity. 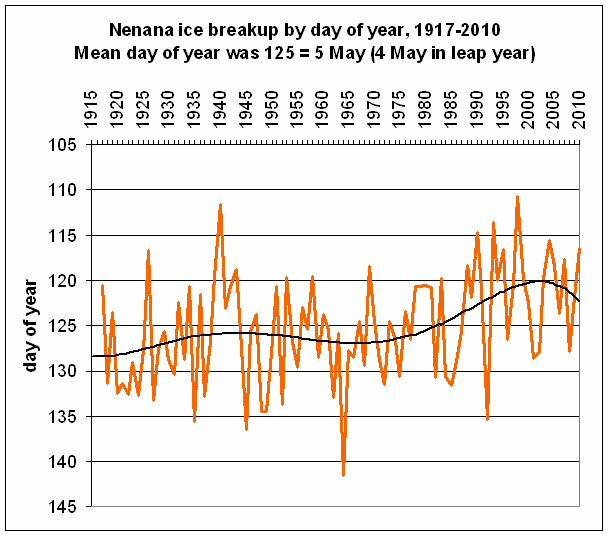 Should you have therefore bet on the Nenana ice breakup being later in 2010? Not necessarily, because the smart money is on El Niño. 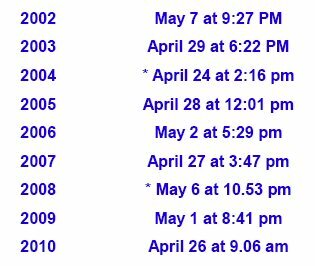 The earliest melts in the Nenana record were on April 20 1940 (April 21 if not a leap year) and on April 20 1998. Both followed strong El Niño warmings in the eastern Pacific. So anyone aware of the major El Niño in progress in recent months might well have wagered on an April melt. In any case, you have to predict the time of day of the breakup – by hour and minutes – which leaves the most thoughtful analyst with little advantage over the general public in Alaska, who may just guess. Simpler and surer bets about the climate take a long time. Ten years ago, mirth and outrage followed my suggestion on German television that global warming had stopped. That led to a written wager with the TV producer. My expectation was a little premature and in 2006, because the satellite data did not go my way, I handed over the € 500. Much more important than that was my growing confidence that I had not misled the German TV viewers about global warming having stopped. 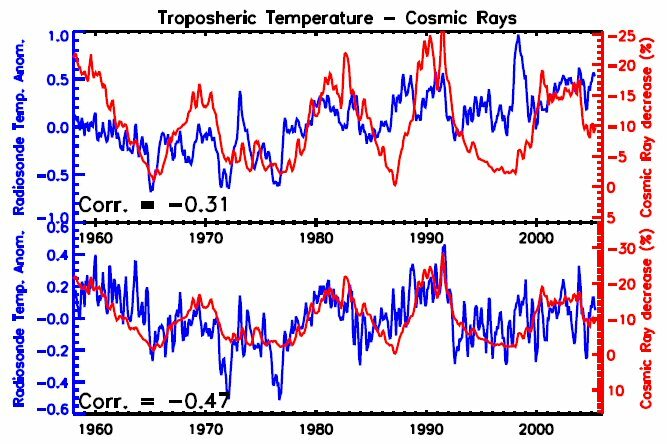 Henrik Svensmark and Eigil Friis-Christensen in Copenhagen confirmed it in 2007, using tropospheric and oceanic temperature data. Others did so with officially publicized surface temperatures, so that by 2009 Kevin Trenberth, a prominent global warmer at the US National Center for Atmospheric Research, was admitting in a leaked “Climategate” e-mail that “we can’t account for the lack of warming at the moment and it is a travesty that we can’t”. Do we see just a hesitation in global warming, or the start of a prolonged cooling? In the second edition of The Chilling Stars (2008), Svensmark and I said “enjoy the global warming while it lasts”, and Svensmark repeated the remark in a Danish newspaper in 2009. Words, you might say, come cheap, but two Russian physicists have serous money riding on an expected decline in temperatures. Vladimir Bashkirtsev and Galina Mashnich at the Institute of Solar-Terrestrial Physics in Irkutsk published in 2003 a paper entitled “Will we face global warming in the nearest future?” They answered the question with a determined “No”. To account for what they called “the cooling that has already started” Bashkirtsev and Mashnich traced the clear link between sunspot counts and temperatures, in Irkutsk and globally, over the period 1882-2000, and they went on to endorse a prediction that sunspot cycles would weaken over the coming decades. In 2005, the Russian pair agreed to a $10,000 bet about it with James Annan, a British pro-warming climate modeller working in Yokohama. As reported by Jim Giles in Nature, Mashnich and Bashkirtsev said that the average global surface temperature in 2012-17 would be lower than in 1998-2003, using data from the US National Climatic Data Center. Solar activity certainly seems to have declined in the Russians’ favour. But like the gamblers themselves, onlookers must now wait until 2018 to know the outcome. A merit of the Nenana Ice Classic is that it demands only a few weeks’ patience from the punters . V.S. Bashkirtsev & G.P. Mashnich, G.P., “Will we face global warming in the nearest future?” Geomagnetism and Aeronomy, Vol. 43, pp. 124-127.2003.